Last week on a stunningly beautiful day I made my way up to the Cloisters. It's one of those places that is largely a secret, since it is so far uptown, but it is such a lovely place. And that goes double this year, as they celebrate their 75th anniversary. Until last month they had the Search for the Unicorn exhibit (I was sad to see that the Narwhal tusks had been put away - if you didn't know they came from an odd-looking whale, those "horns" would make you a believer in unicorns), and now they have placed Janet Cardiff's Forty Part Motet in the Funtidueña Chapel, which is the first chapel on the right. I'll be honest, I strode right past the Funtidueña Chapel and headed for the Saint-Guilhem Cloister, which is always a favorite, with it's little bubbling fountain and serene skylight. Checked out the flowers blooming in the Cuxa Cloister... I wandered over the whole museum, spending lots of time with the Unicorn Tapestries and then in the Bonnefont Cloister. For me one of the charms of the Bonnefont Cloister is the inclusion of plants relevant to the fiber arts: fibers themselves, dyes, and mordants. It's a reminder of how much the world has changed that people used to grow the stuffs necessary to make their own clothes. The other charms include the profusion of plants, views of the Hudson, and the cozy sheltered place itself. I want to know who has an anchorage in front of the Cloisters! Eventually, I made my way back to the entry hall and figured I should check out this music. One of the things I usually love about the Cloisters is how quiet it is, so I was the tiniest bit annoyed by the music (no matter how lovely), when I arrived. But by the end of my usual circuit, I got over myself. And I'm so glad I did! The Forty Part Motet is ... magic. There isn't really another word for it. Well, actually, there are plenty of words (gorgeous, soaring, profound, immersive, unusual, thought-provoking). I made a little movie, but you really have to experience it for yourself - sitting on a bench in the middle or walking around and experiencing the sound. So, what's all this visiting the Cloisters about? I'm feeling the rumblings of some patterns here. All those carved stone elements? Cables! The flowers and colors in the tapestries? Colorwork! Actual flowers and fruits in the gardens? Lace! Stand-alone patterns? Booklet? Full-on book? I'm still trying to figure out what it's all going to be, but I've got to find something to keep me busy now that the kids are back in school. Don't want me getting in trouble on the streets, do we? The Cloisters is one of my favorite places in the world and Cardiff is one of my favorite artists so I'm looking forward to making a visit there very, very soon! Can't wait to see how you've been inspired! 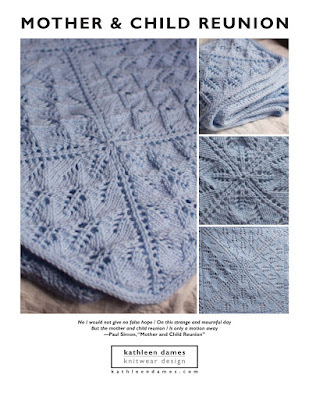 Jane Austen Knits patterns now on Ravelry!